To Cite: Choi H G, Park M J, Choi H C, Choi H Y, Shin H S, et al. Assessment of the Coronary Artery in High-Pitch, Dual-Source CT Aortography Without ECG Synchronization, Iran J Radiol. 2017 ; 14(3):e22024. doi: 10.5812/iranjradiol.22024. Background: The high pitch, dual source computed tomography (CT) provides motion-free aortic imaging. Objectives: To evaluate the image quality of coronary artery using dual-source CT aortography without electrocardiogram (ECG) synchronization. Patients and Methods: One hundred fifty patients (87 men; mean age; 63.7 ± 13.0 years, mean heart rate; 64.7 ± 6.6 beats/min) with suspected or known aortic disease underwent non-ECG gated, high-pitch, dual-source CT aortography. No beta blocker or nitroglycerin was administered for the patients. The image quality of each coronary artery segment and its ostium was graded on a three-point scale (excellent, moderate, and non-diagnostic image quality). Results: Most patients (88.7%) showed diagnostic image quality in the ostia of the left main and right coronary artery. Among 1894 coronary arterial segments, 870 (45.9%) segments were rated as excellent image quality, 507 segments (26.8%) were rated as moderate image quality, and 517 segments (27.3%) were rated as non-diagnostic image quality. In the per-vessel analysis, non-diagnostic image qualities were often found in right coronary artery (44.0%) and left circumflex artery distribution (36.0%). In contrast, non-diagnostic image qualities were less frequently found in left main (0.67%) and left anterior descending distributions (9.9%). Conclusion: Non-ECG gated, high-pitch, dual-source CT can be useful to evaluate the coronary ostial involvement in patients with ascending aortic dissection. The left main and left anterior descending coronary arteries exhibit relatively good diagnostic image qualities compared with left circumflex and right coronary arteries. 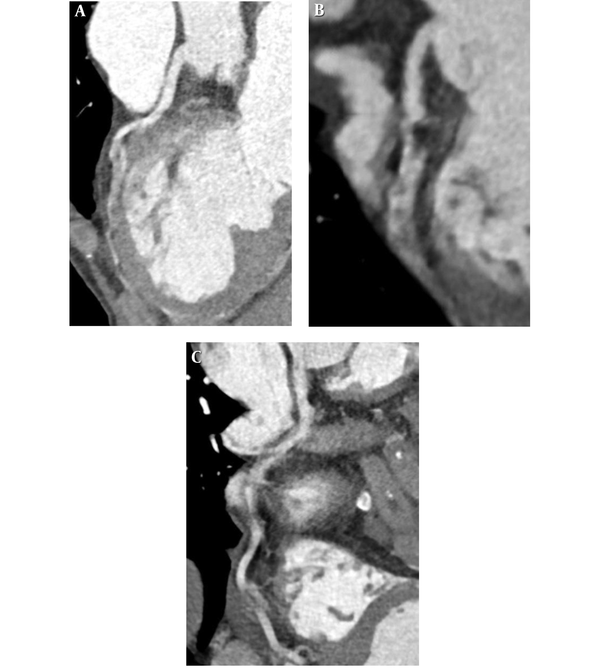 Computed tomography (CT) aortography has been widely used to evaluate aortic disease for initial diagnosis and follow-up. Presence of coronary artery disease (CAD) has been reported in initial diagnosis and follow-up of patients with aortic dissection and aortic aneurysm (1-4) and it has also been reported to affect mortality after surgical repair (5). Furthermore, triple-rule-out CT has been widely used to evaluate the cause of acute chest pain such as aortic disease, pulmonary thromboembolism, and coronary artery disease (6, 7). Even though the heart is included in triple-rule-out CT, additional electrocardiogram (ECG)-gated, coronary CT is needed for the evaluation of CAD to minimize cardiac motion artifact. High-pitch CT provides fast volume coverage, high temporal resolution at a low radiation dose in young and adult patients (8-12). Especially, ECG-gated, high-pitch, dual-source CT exhibits good diagnostic performance for evaluation of coronary artery disease (9, 12-14). However, coronary CT angiography should be performed carefully, because ECG electrodes must be attached in the anterior thoracic wall, and beta-blockers are necessary to reduce heart rates in patients with high heart rates. Motion-free aortic imaging of the ascending aorta is possible with high-pitch dual-source CT without ECG synchronization (11). The left and right coronary arteries arise from the coronary cusp of the aortic root. It is particularly important to evaluate the coronary ostial involvement in patients with ascending aortic dissection. We speculated that the coronary artery is less affected by cardiac motion using high-pitch CT compared with conventional CT. The purpose of this study was to demonstrate whether high-pitch dual-source CT aortography is feasible for evaluating coronary artery disease without ECG synchronization. One hundred fifty consecutive patients (mean age, 63.7 ± 13.0 years, 87 men) who underwent CT aortography were included in this study. CT aortography was performed to evaluate suspected aortic dissection (n = 122), perioperative evaluation for vascular surgery (n = 20), and follow-up for aortic aneurysm (n = 8). We excluded the patients with suspected acute coronary syndrome such as ST-elevated myocardial infarction, and elevation of cardiac enzymes. We also excluded patients with heart rates higher than 80 beats/min due to motion artifacts, but we included patients with arrhythmia. We excluded patients with previous hypersensitivity reaction to contrast material and renal failure with high serum creatinine. Premedication such as beta blocker or nitroglycerin was not administered for this study. The patients’ heart rates were measured 10 - 20 minutes prior to CT examinations, because the ECG electrode was not attached in the chest wall during conventional CT aortography. The mean heart rate (MHR) was defined as mean value of heart rate during exam and the heart rate variability (HRV) was defined as the difference between the minimum and maximum heart rates. This study was approved by the institutional review board and the written informed consent was waived. CT scans were performed with second generation, dual-source CT (Definition Flash; Siemens Medical Systems, Forchheim, Germany). The CT aortography were performed with 120 mL of contrast media (400 mg iodine/mL, Iomeron, Bracco Imaging SpA, Milan, Italy), followed by 30 mL of saline solution, both at a flow rate of 4 mL/sec. A bolus tracking was used in the descending thoracic aorta, and CT was automatically started 12 seconds after the aortic attenuation reached 250 Hounsfield units (HU). The scan parameters of CT aortography were as follows: slice acquisition, 128 × 0.6 mm with a z-flying focal spot; gantry rotation time, 280 milliseconds; pitch, 3.0; tube potential, 100 kV; and effective tube current, 320 mAs/rotation. With the gantry rotation time of 0.28 second, a half-scan reconstruction applied a temporal resolution of 75 milliseconds. The automatic tube current modulation was used to reduce the radiation exposure (Care Dose 4D; Siemens Medical Solutions, Forchheim, Germany). CT scans were performed from clavicular head level to symphysis pubis with craniocaudal direction and a single breath hold during deep inspiration. Image reconstruction was applied as a slice thickness of 0.75 mm and an increment of 0.5 mm with a medium kernel (B26f). The CT raw data were transferred to the commercially available software (Aquarius version 4.4.6.85, Terarecon, San Mateo, California) to generate curved and straight multiplanar reformatted images. The 16-segment model, proposed by the American heart association (AHA), was used to assess the segment of coronary artery (15). Each vessel was analyzed in two imaging planes that included one curved multiplanar reformation view and one cross-sectional view. We divided the sixteen coronary artery segments into the following four groups (16): (1) proximal segments (ex, 4 segments levels), including AHA segments 1, 5, 6, 11; (2) the proximal and middle segments of the coronary arteries (ex, 7 segment levels), including AHA segments 1, 2, 5, 6, 7, 11, and 13; (3) 10 segments levels, including AHA segments 1, 2, 3, 4, 5, 6, 7, 8, 11, and 13; and (4) the complete coronary arterial tree (ex, 16 segment levels), including the total of 16 segments. Furthermore, we evaluated the coronary ostia with less than 2 cm distance from the aorta in the left main coronary artery (LMCA) and right coronary artery (RCA). We also assessed the motion artifacts in the ascending aorta. The image quality of the coronary artery and ascending aorta were independently evaluated by two radiologists (2 and 7 years of experience in cardiovascular imaging) and the three-point grading scale was used according to the severity of motion artifact. If there were any discrepancy between the two readers, the final decision was reached in consensus. Score 1 was defined as excellent image quality with no motion artifact, score 2 was defined as moderate image quality with mild luminal blurring, and score 3 was defined as a non-diagnostic image quality with severe luminal blurring. We did not consider the other factors that affect the subjective image quality such as severity of calcification and image noise. Contrast-to-noise ratios (CNR) in the LMCA and proximal RCA were measured by two readers independently (17). The region of interest was placed in the contrast enhanced arterial lumen, trying to avoid the atherosclerotic plaque. The vascular contrast was defined as the difference of the mean attenuation between the contrast-enhanced lumen and the adjacent perivascular soft tissue. The image noise was measured as the standard deviation of the region of interest in the ascending aorta. CNR was calculated as the vessel contrast divided by the image noise (17). The dose-length product of each patient was obtained from the CT dose report. The effective dose from the CT aortography was estimated based on the dose-length product using a conversion coefficient (k = 0.017 mSv × mGy-1 × cm-1) for the aortas of adults (14, 18). The data were analyzed with SPSS software (version 21.0, SPSS Inc., Chicago, Illinois, USA). All data were tested for normality using Shapiro-Wilk tests. Continuous factors were expressed as means ± SD if distributed normally, otherwise those factors were expressed by medians with the interquartile range. Continuous factors are expressed as the means ± the standard deviations, and categorical factors are expressed as the frequencies or percentages. A P value < 0.05 was considered statistically significant. The interobserver agreement for the image qualities was evaluated using Cohen’s kappa. The chi-square test was used for categorical data and the unpaired Student’s t-test was used for numerical variables. The patients’ characteristics and scan parameters are presented in Table 1. The interobserver agreement was good regarding the image quality scores. The mean image qualities per segment were 1.83 ± 0.79 in the first reader and 1.84 ± 0.80 in the second reader. Same scores between two readers were obtained in 1599 of 1894 segments. The Cohen’s kappa was 0.755 (P < 0.001), which indicated good interobserver agreement. The majority of the patients exhibited no motion artifacts in the ascending aorta. Only one patient exhibited a respiratory motion artifact at the aortic valve level, and a double aortic contour was observed in the ascending aorta. Specifically, this patient exhibited poor image quality in LMCA. The 1894 coronary arterial segments were visualized in our study (12.7 ± 1.4 segments per patient; Table 2). Among 1894 segments, 870 (45.9%) were rated as excellent image quality (score 1), 507 segments (26.8%) were rated as moderate image quality (score 2), and 517 segments (27.3%) were rated as non-diagnostic image quality (score 3). Figures 1 and 2 were shown the representative images with excellent and non-diagnostic quality scores. The mean image quality score per segment was 1.83 ± 0.81. 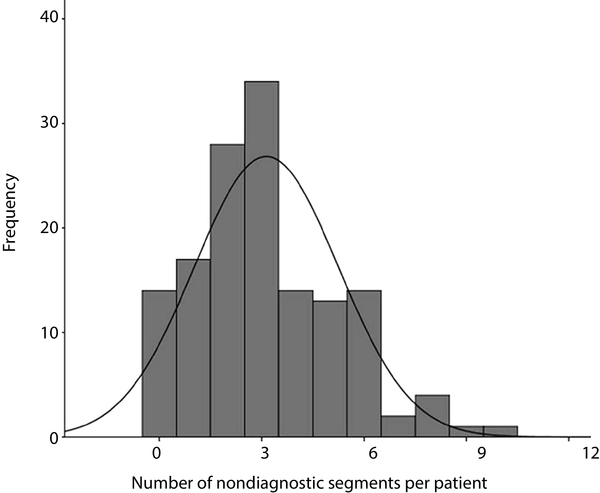 In the per-patient analysis, 14 patients (9.3%) showed all segments with diagnostic image quality (scores of 1 and 2), and 136 patients (90.7%) showed at least one segment with non-diagnostic image quality. In the per-patient analysis, the number of segments with non-diagnostic image qualities per patient was 3.0 (2.0 - 4.0) (Figure 3). In the per-vessel analysis, non-diagnostic image qualities were often observed in RCA (44.0%, 262 of 595 segments) and left circumflex artery (LCx) distributions (36.0%, 187 of 519 segments). In contrast, non-diagnostic image qualities were observed less frequently in the left main (0.67%, 1 of 150 segments) and left anterior descending artery (LAD) distributions (9.9%, 60 of 608 segments). Figure 2. A 50-year- old man with a mean heart rate of 53 beats/min and heart rate variability of 5 beats/min. A - C, Curved multiplanar reformations and cross-sectional images of the left anterior descending (A), left circumflex (B), and right coronary arteries (C) show excellent image quality. Figure 3. A 67-year- old man with a mean heart rate of 73 beats/min and heart rate variability of 6 beats/min. A - C, Curved multiplanar reformations of the left anterior descending (A), left circumflex (B), and right (C) coronary arteries show nondiagnostic image quality. We also evaluated the diagnostic image qualities of the segments according to the four levels (Table 3). The median numbers of diagnostic segment were 4.0 (3.0 - 4.0) at the 4-coronary segment level, 6.0 (5.0 - 6.0) at the 7-segment level, 8.0 (6.0 - 9.0) at the 10-segment level, and 10.0 (8.0 - 11.5) at the 16-segment level. The percentage of diagnostic segments per evaluated segment was the highest (83.6%) at the 4-segment level, whereas this value was lowest at the 10-segment (73.2%) and 16-segment (72.7%) levels. Furthermore, the percentages of patients with diagnostic image qualities were 60.0% at the 4-segment level, 22.7% at the 7-segment level, 13.3% at the 10-segment level, and 9.3% at the 16-segment level. Furthermore, we evaluated the image qualities in the ostia of LMCA and RCA. Most patients (88.7%, n = 133) showed diagnostic image quality in the ostia of both LMCA and RCA. aFour segment level indicates AHA segment 1, 5, 6, 11, 7 segments level indicates AHA segment 1, 2, 5, 6, 7, 11, 13, 10 segments level indicates 1, 2, 3, 5, 6, 7, 8, 11, 12, 13, and 16 segments level indicates all sixteen segments. The interobserver agreements were excellent for the attenuation in LMCA and RCA (r = 0.79; P < 0.01), the attenuation of the perivascular tissue (r = 0.73; P < 0.01), and the standard deviation of the ascending aorta (r = 0.87; P < 0.01). The average image noise was 31.5 ± 6.7 HU (22.7 - 51.2 HU). The average attenuations of LMCA and RCA were 392.9 ± 116.0 HU (204.3 - 631.2 HU) and 388.8 ± 118.3 HU (268.7 - 703.6 HU), respectively. The average CNRs of LMCA and RCA were 29.6 ± 9.4 HU (14.2 - 53.2 HU) and 29.0 ± 8.9 (18.5 - 58.3), respectively. The mean dose length product was 243.7 ± 36.4 (212 - 274) mGycm, and the mean effective radiation dose was 4.1 ± 0.6 (3.6 - 4.6) mSv. Non-ECG gated, low pitch CT is well known to be insufficient for evaluating the ascending aorta and coronary artery due to the cardiac motion artifact (19). 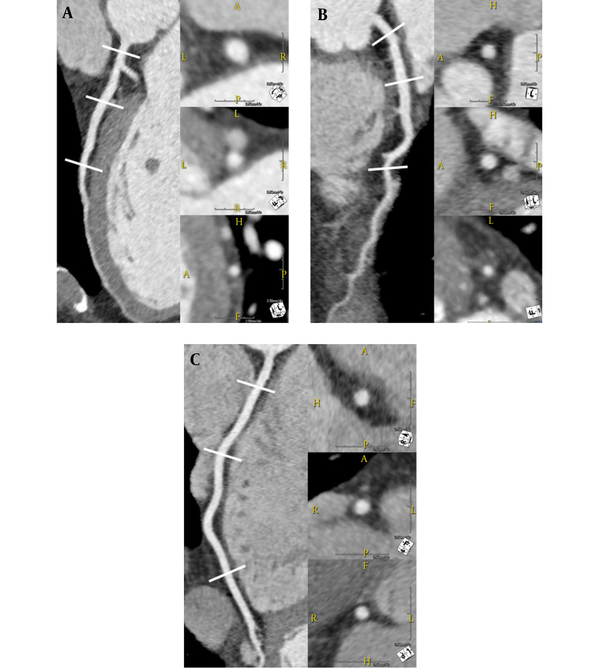 Our study demonstrated that the ascending aorta, LMCA and LAD exhibited relatively good diagnostic image qualities compared to LCx and RCA in high pitch, dual source CT aortography. Furthermore, this technique can be useful to evaluate the coronary ostial involvement in patients with ascending aortic dissection. Prospectively ECG-triggered, high-pitch mode (flash mode) can decrease the estimated radiation dose compared to low pitch mode (19). The high table speed at the pitch of 3.2 is an effective method for achieving entire aorta examination in a single session without ECG synchronization. Furthermore, the high-pitch helical acquisition mode in the dual-source CT enables the gapless image reconstruction. The transitions between sequential images are smooth, so misalignment or stair-step artifacts do not occur. A previous report demonstrated that 100 kVp is sufficient for obtaining the diagnostic image quality of the coronary arteries in patients with low body mass index (BMI) or low weight (10). We excluded the patients with body mass index (BMI) of higher than 30. We could apply 100 kVp to reduce the radiation dose. The radiation dose of CT aortography was measured as 4.1 mSv in our study. Theoretically, cardiac motion artifacts can be reduced by fast scanning, ECG-gating, or postprocessing of the scan. Our study demonstrated that most patients exhibited no motion artifact in the ascending aorta. Only one patient showed a respiratory motion artifact in the ascending aorta level, thus the ascending aorta and LMCA exhibited poor image qualities. It has been reported that non-ECG gated, high-pitch CT can provide motion-free aortic imaging in the ascending aorta (11, 20). Furthermore, the evaluation of proximal coronary artery in patients with ascending aortic dissection is important to assess the coronary involvement of dissection flap or the coronary ostium originated from true or false lumen. We found that the majority of patients showed the diagnostic image quality in the ostia of LMCA and RCA. Hence, we expected that high-pitch CT angiography (CTA), compared to conventional low pitch CT, could provide the good image quality to evaluate the coronary artery ostial involvement in patients with ascending aortic dissection without additional ECG-gated coronary CT angiography. High pitch, CT aortography provides good contrast enhancement and objective image quality of the coronary artery. Our study demonstrated a good CNR and low image noise in the coronary artery. Previous studies reported that good contrast enhancement in the coronary artery can be obtained in high-pitch dual-source CTA (8, 20). On the other hand, the subjective image quality is not good in high-pitch CT aortography. Our study demonstrated that the LMCA and LAD were less affected by motion artifacts than LCx and RCA. The cause of this phenomenon has been well documented in early studies of coronary artery imaging using electron beam CT. Previous studies demonstrated that motion velocity of the coronary artery is highest in RCA followed by LCx and LAD (21, 22). Furthermore, the motion of LAD exhibited no significant differences throughout the cardiac cycle, but the motions of LCx and RCA vary significantly throughout the cardiac cycle in patients with heart rates < 80 beats/min (22). The motion free, cardiac phase was late-systole and mid-diastolic phase in patients with heart rate < 80 beats/min, but this phase was shortened in the patients with heart rate > 80 beats/min (22). The similar result was obtained in the previous study using third generation dual source CT (19). These results indicate that non-ECG gated CT does not guarantee the acquisition of motion-free imaging of the whole coronary artery even in high-pitch mode. The majority of patients had at least one segment with non-diagnostic image quality in our study. We found that approximately three segments per patient were of non-diagnostic image quality. In contrast, non-ECG gated, high-pitch CT is sufficient for obtaining the diagnostic coronary artery imaging in LMCA and LAD. The CAD in LMCA and proximal LAD are clinically important because significant stenosis in the LMCA and proximal LAD, compared to the other coronary segments, are associated with poor prognosis for cardiovascular event (23, 24). We also analyzed the subjective image qualities in per-segment and per-patient analyses according to four levels. The subjective image qualities in our study were poor compared with those of a previous study, using ECG-gated high-pitch dual-source coronary CT in patients with heart rate > 70 beats/min (25), even though we enrolled the patients with heart rate < 80 beats/min. Another study analyzed the diagnostic image qualities using non-ECG gated high-pitch dual-source CT in patients with high heart rates (mean heart rate (MHR) = 86 beats/min). Compared with our results, the diagnostic image qualities in the per-segment analysis were similar at the 4-segment level (88% vs. 84%) and 7-segment level (75% vs. 75%) but decreased at the 10-segment level (61% vs. 73%) and 16-segment level (48% vs. 73%) (16). Furthermore, the diagnostic image qualities in the per-segment analysis were similar at the 4-segment level (67% vs. 60%) and 7-segment level (23% vs. 23%) but decreased at the 10-segment level (3% vs. 13%) and 16-segment level (0% vs. 9%) (16). These results suggest that the image qualities were not hampered at the proximal and mid-coronary segment levels but were worsened at the distal coronary segments and branch vessel in patients with high heart rate. Therefore, additional invasive coronary angiography or ECG-gated, coronary CT angiography is needed to evaluate the distal run-off vessel of obstructive CAD, especially for the patients requiring coronary artery bypass graft. The study limitations are as follows. First, the high-pitch CT aortography was performed not for CAD evaluation but for aortic disease evaluation. The diagnostic performance of coronary CT was not verified with invasive coronary angiography. Additionally, beta-blockers or nitroglycerin were not administered in this study. Additional studies are needed to evaluate the diagnostic performance of high-pitch CT aortography. Second, our study only focused on the motion artifact rather than calcification regarding subjective image quality. Calcification is a well-known factor that reduces the quality of images of the coronary artery (26). Third, the heart rates were measured before CT scan, so the heart rates could have been different during the CT scans. Fourth, we selected the patients with low heart rate and low to moderate BMI. Therefore, the image quality was hampered in case of patients with high heart rate or high BMI. In conclusion, non-ECG gated, high-pitch dual-source CT can be useful to evaluate the coronary artery ostial involvement in patients with aortic dissection. LMCA and LAD were imaged with relatively good diagnostic quality compared with LCx and RCA. Conflict of Interests: No conflict exists for any of the authors.